A new children's rights organization, appropriately named Intact America, has been formed to combine the work of other genital integrity organizations and move the discussion into mainstream media. Healthy, functioning tissue is amputated from a helpless baby. Many have taken the position that the procedure is a human rights violation. The question is whether parents have the right to consent to an unnecessary procedure that has lifelong consequences. If you were circumcised at birth, you had no choice in the matter. 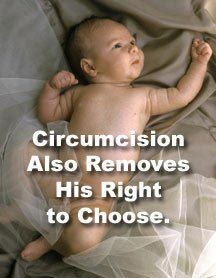 Forced circumcision removes your right to bodily integrity. It is against the law to circumcise a dog so dogs have more rights than baby boys.